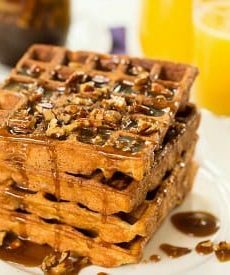 Cinnamon-spiced waffles topped with a praline syrup and pecans. Preheat oven to 200 degrees F. Preheat a Belgian waffle maker according to the manufacturer's instructions. In a large bowl, whisk the egg yolks, then whisk in the buttermilk, melted butter and vanilla extract. In a medium bowl, whisk together the flour, sugar, cinnamon, baking powder, baking soda and salt. Add the flour mixture to the egg yolk mixture and whisk until smooth. In another medium bowl, beat the egg whites until stiff peaks form. Using a rubber spatula, gently fold half of the egg whites into the batter, then gently fold in the remaining egg whites. Cook the waffles according to the manufacturer's instructions. Transfer to a baking sheet and keep warm in the oven. In a large skillet over medium-high heat, combine the brown sugar, butter, maple syrup and salt. Heat the mixture, stirring when the butter begins to melt. Continue to cook, stirring constantly, until the syrup is smooth, about 3 to 4 minutes. Stir in the pecans, then remove from the heat. Spoon the syrup over the waffles and serve immediately.